Answer: Yes. You are considered laid off due to lack of work and you need to meet personal and monetary eligibility. However as a federal employee, you also need to be aware of several unintended consequences of applying for unemployment insurance benefits. You will not receive your first unemployment insurance payment for approximately three weeks after you file for benefits. If the federal government compensates you or back pays you for the work you missed during the furlough (as it has historically), you will be required to disclose your payment information to the department and repay any unemployment insurance benefits you collect during that time. You are required to seek work and make at least two job contacts per week. Q. Once the shutdown is over, if the federal government back pays us for our time away from work, is this income reportable? If so, how should I report my income? A. Yes. If you receive your back pay, call us at (208) 332-8942 and let us know. Q. Once the shutdown is over, if the federal government back pays us for our time away from work, do I have to repay benefits? A. Yes. For unemployment insurance purposes, any back pay you receive from the federal government is reportable income for the weeks you are furloughed and will result in an overpayment of benefits. Please be aware that unpaid overpayments accrue interest of about 11 percent after 30 days from the overpayment establishment. If you have an outstanding overpayment balance, the department will seize your state tax refund, potentially delaying your refund. If your overpayment balance exceeds $350, you must contact us at (208) 332-3842 to set up a repayment agreement that does not exceed three months to avoid a lien being filed against you. This entry was posted in Unemployment Insurance and tagged Army Corps of Engineers, federal benefits, federal government shutdown, federal government shutdown unemployment, federal pay, federal pay and benefits, federal shutdown, federal workers, furloughed federal workers, Homeland Security, idaho, idaho department of labor, Idaho Forests, Internal Revenue Service, IRS, Justice Department, National Monuments, National parks, TSA, unemployment insurance benefits, unemployment insurance for federal workers, US Fish and Wildlife, USFS, who doesn't get paid during a federal shutdown on December 22, 2018 by Idaho Department of Labor. FAQ Friday – Can federal workers receive unemployment benefits? Unemployment insurance Information for furloughed federal workers about the 2018 federal government shutdown can be found here. Q. I am a federal worker who has been furloughed. Am I eligible for unemployment? A. You are eligible to file for unemployment insurance compensation. You would need to meet personal and monetary eligibility, but would be considered laid off due to lack of work. A. You must file online at labor.idaho.gov/iw. We do not file claims over the telephone. If you do not have Internet access or need help filing online, you may file at your nearest local Idaho Department of Labor office. If you are filing a claim against Idaho, but live in another state, you may also file your claim online at labor.idaho.gov/iw. A. We have computers available in all of our local offices. Twenty-three of the 25 department local offices are open from 9 a.m. to 5 p.m. Monday through Thursday and from 9 a.m. to noon on Friday. The Wood River office in Bellevue is open from 9 a.m. to 4 p.m. Monday through Wednesday and closed Thursday and Friday. The Soda Springs office is open from 9 a.m. to 3 p.m. Monday through Thursday and closed Friday. Q.What information do I need in order to file? A. It depends on how much you are paid in vacation. If your vacation pay is an amount that is one and a half times your unemployment insurance weekly benefit payment amount, it is not a compensable week — meaning you received too much money for an unemployment insurance payment or waiting week credit that week. In order to be eligible for benefits, you must also be fully available for work. It is important that you remain available for work and express your availability for work to your employer, even though you have elected to be paid vacation. Q. When will we (federal employees) who claimed 9/30 as the last day work get the first check? A. If you are a federal employee, your wages are not immediately available to us when you file your claim. We have to request your wage information from the federal government. When you file a claim, you will be sent a letter called a monetary determination stating you are eligible for $0 with an explanation there are wages pending from the federal government. Once we receive wage information, we will send you a second monetary determination with the wage information they reported to us. Despite the federal shutdown, we are getting responses to wage requests. It is important you continue filing your weekly reports at www.labor.idaho.gov/cc, while you wait for your new monetary determination. If you have filed your weekly reports and are otherwise eligible, you will be sent payments for compensable weeks filed once we receive your wage information. 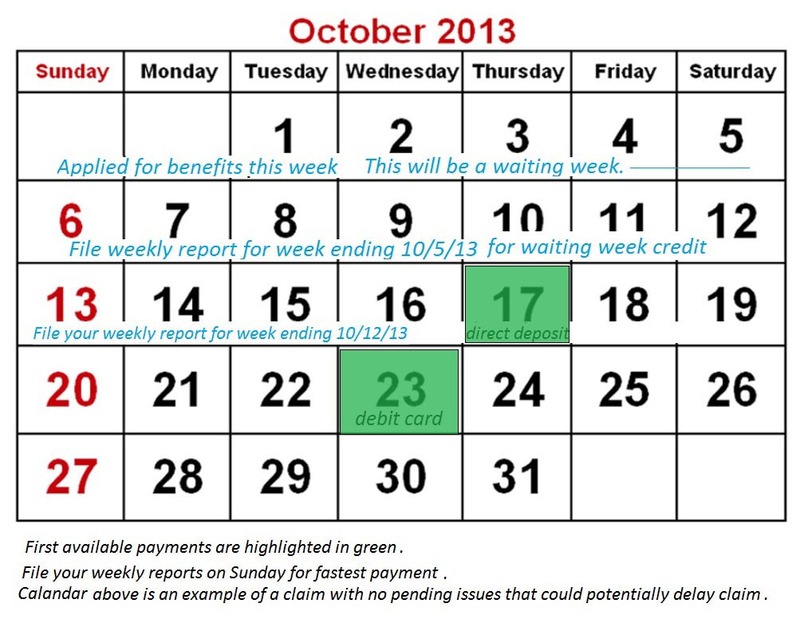 It can take up to three weeks to receive your wage information. If your monetary determination did not state that federal wages are pending, please call us at 208-332-8942. A. Yes. This income is reportable. It would be treated as back pay and reportable for the weeks you were furloughed and could likely create an overpayment. When you receive payment, call us at 208 332-3842 to inform us of your back pay. If you have been paid any unemployment benefits, you will be required to repay those benefits. A. Yes. Unemployment benefits are treated as taxable income. When you file your claim, you will have the option to have either 10% or 0% federal taxes withheld from your payment. If you have to repay benefits, you will have to repay the gross amount however, as we are unable to recoup the 10% for you. You will receive a 1099G at the end of the year with your tax information. This entry was posted in FAQ Friday, Unemployment Insurance and tagged federal government shutdown, federal workers, furlough, idaho department of labor, unemployment benefits, unemployment claim, unemployment insurance on October 2, 2013 by Idaho Department of Labor.